Entertaining Food: Brunch Worth The Wait? Aaaah, breakfast: you luscious, eggy, buttery, bacony, delicious event filling my plate with the edibly divine in the form of foods you're not allowed to eat at every meal. I think that's why no other meal can really compare to breakfast and why Chris, Ryan, and I definitely go out of our way to enjoy it. Circa does what it can to keep up with the Joneses, but falls a bit flat compared with our expectations. After a 30-minute wait, we were finally seated. Circa's brunch menu reads like a who's who of the brunchy standards: Louisiana Eggs Benedict, Hawaiian French Toast, several omelettes and scrambles, along with a handful of sandwiches including the Circa Burger and Beer Battered Fish and Chips. From what we saw at other tables and experienced for ourselves, the portions are on the large side, looked amazing, and the service was decent, if not overly attentive. For some reason, Chris decided that breakfast wasn't good enough for him and ordered the Steak Salad (I don't get it either!). The "house favorite" salad was quite large and Chris barely finished off the beef itself. The generously portioned "marinated, naturally-raised Painted Hills skirt steak" was beautifully charred and sliced in chunky strips that sat atop the mixed greens base. Chris said the steak was juicy and excellent and I must admit I agreed (despite my less than hearty enjoyment of steak). The salad was dressed with a balsamic vinaigrette, large-chopped tomatoes, and a small amount of Gorgonzola sprinkled over the greens. Despite it not being breakfast, Chris was quite pleased with his choice. Fortunately, I was able to count on Ryan to stick with the breakfast theme. Ryan ordered the Big and Fluffy Banana Pancakes. 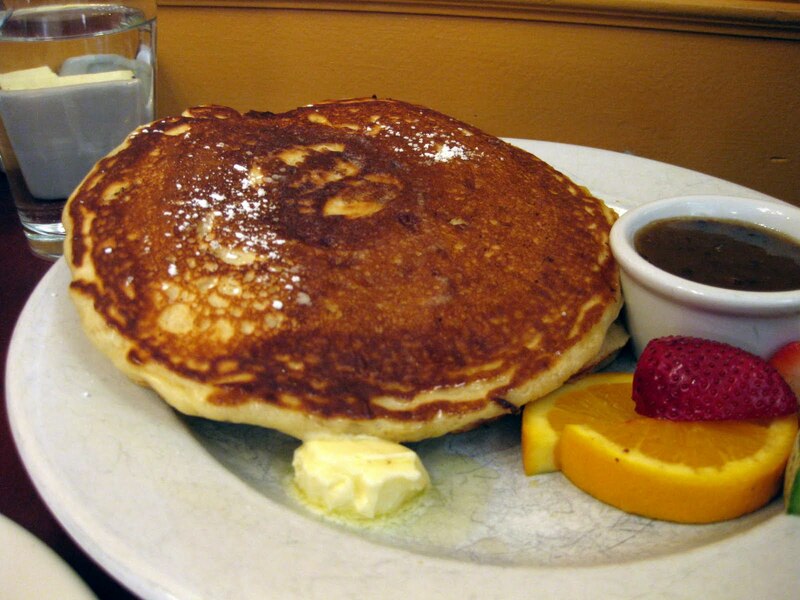 The two average-sized pancakes where light and fluffy, if not "big". They were filled with pieces of banana and served with thick-cut, well-cooked and crispy bacon. The order comes with your choice of eggs and Ryan's scrambled eggs arrived on a second plate (not pictured). The only drawback was the pecan praline syrup. Ryan felt it was overly sweet and was left wishing they just had regular maple syrup. It was the first time any of us had seen such a non-traditional syrup, so you'll have to pass this up if you have nut allergies or it just doesn't sound appetizing as there weren't any alternatives available. This may not seem like a big deal, but at least half of the flavor profile of "pancakes and syrup" is the syrup and this one was overwhelming. 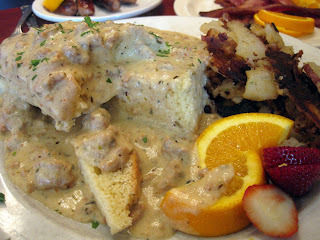 The second "ding" against Circa were the Biscuits and Country Gravy that I ordered. The portion was large and the biscuits were definitely original. However, instead of being served as individual biscuits, they baked off the cake-like mixture in a sheet pan and then cut out rectangles to be served. I can see how this would be infinitely easier than having to roll out, cut, prep, and bake-off a multitude of biscuits, but it felt like a shortcut that definitely wasn't worth it to me. The biscuits were texturally mediocre (think cornbread cake) and completely missing all of the flaky, pillowy goodness that make for extraordinary biscuits. The sausage gravy was obviously very chunky and there was plenty of it, but the flavor was average on the whole. My scrambled eggs were light and fluffy and the potatoes were extra crispy and tasty. Oddly, the eggs with the biscuits and gravy as well as Ryan's pancakes were served on a completely different plate which just cluttered the table and broke up the breakfast experience as you had to shuffle plates to eat different parts of your breakfast. Overall, we felt the quality ingredients couldn't put their best foot forward through odd flavor pairings and mediocre biscuits. Chris' steak salad definitely saved the day for Circa and is the reason they edged up to 3.5 Stars. That said, Circa's eclectic menu should provide any party the opportunity to find something they'd really like to eat and I'd recommend trying Circa's offerings for yourself. We go to Circa probably once a week (for brunch). They always offer maple syrup as a substitute, as it is on the kids menu and served with the Hawaiin French toast. Tiffany Outlet Store some surprise, that the vial looked small, but did not think it was a spiritual space, wherein the quenching powder like ever use in general, applied for a long time, did not feel the weight of vial reduced.Ah sudden sweat, face twisted sharply elevated above the skin temperature, which capsules tiny dark golden powder as a red-hot iron tablets and Cheap Tiffany Bracelets capsules in general, I feel only their own skin are everywhere at this time at the time of a sense of being fired, that kind of intense pain with the cold virus attack is two extremes.Hold back, this is one way of refining the body extremely harsh, strong refining body who otherwise would not so little today by more than one point you bitter, tomorrow you can save your life more than Cheap Tiffany Browse Key Rings the same capital, the master of the old cheap's voice in the ear side sounded, passed, parents have been known to .